Black women experience highest rates of intimate partner homicide | Real..
Black women experience highest rates of intimate partner homicide of any racial group. CLEVELAND – It was a cold October night in 2014. Sonya Garth’s ex-husband showed up at her Cleveland home. “He came in with intention . . . to kill me,” she said. “But it backfired,” she said. Rufus Gray, 62, pulled out a gun and started shooting at her. Garth’s daughter, Davia, 12, jumped in front of her mother. One bullet hit the little girl. It struck her dead. “All I can hear in my mind is, ‘He shot me mommy,’” said Garth. Davia Garth’s death is one example of what the Centers for Disease Control and Prevention discovered when the agency reviewed racial and ethnic difference in homicides of adult women. While homicide is a leading cause of death for all women under 44, the CDC found non-Hispanic black women are “disproportionately affected” when compared to other racial groups in the United States. In fact, the homicide rate for black women and Native American women was twice that of Asian, Hispanic, and white women. The CDC analyzed 18 years of data from 18 states, including Ohio, compiled by the National Violent Death Reporting System between 2003 and 2014. The overall homicide rate for women was 2 per 100,000 women. When researchers reviewed the statistics for black women, the homicide rate increased to 4.4 per 100,000 women. The rate for American Indian and Alaska Native women was 4.3 per 100,000. The homicide rates for Asian, Hispanic and white women were significantly lower at 1.2, 1.8, and 1.5, according to the CDC. 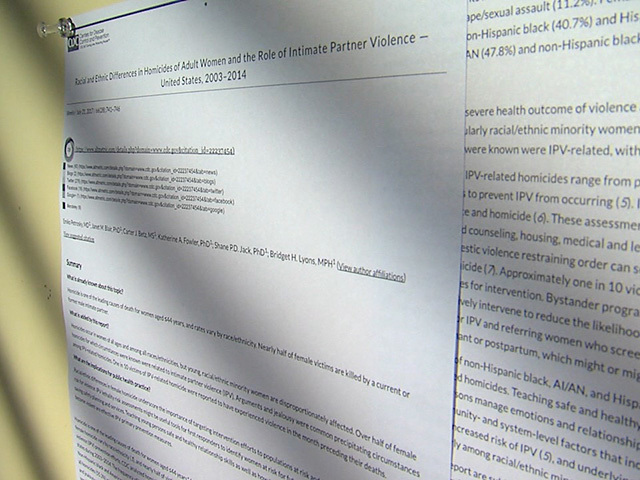 The CDC found domestic violence played a key role in the majority of female homicides. Their report found at least 55.3 percent of female homicides were related to intimate partner violence, which means the victim was killed by their current or former partner or caught in the crossfire of an intimate partner homicide. The report proposed targeted IPV prevention programs for high-risk women and enhanced access to services for all persons to reduce female homicide rates. “We just don’t trust systems,” said Victoria Grant, Justice System Advocate for the Domestic Violence & Child Advocacy Center. “Because systems have never worked in our favor,” she said. 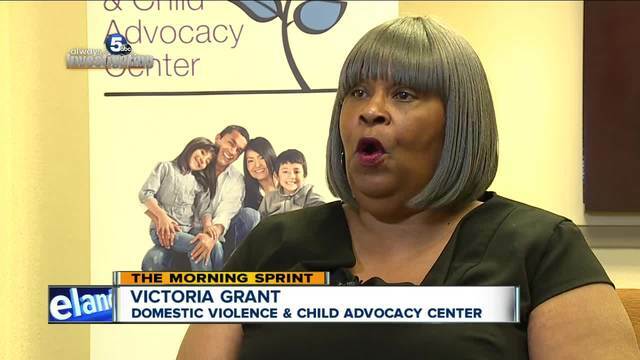 As a result, Grant said African-American women are less likely to contact domestic violence service providers or call police when they’re abused, thus increasing their risk of being killed. Grant said African-American women are often fearful of reinforcing racial stereotypes the black community is violent. Grant has found a solution to help reduce homicide rates among black women. She created the Ujima program, named for the third principle of Kwanzaa. It works with service providers in the African-American community, including several churches, to help victims’ access resources to escape their abusers. Garth wishes she knew about services for domestic violence victims during the years Gray abused her. Now, she said, it’s too late. I have written and lectured extensively when it comes to this phenomenon expressed through violence aimed at Black women by their romantic partners. In a relationship in which Black women should be able to rest safely in the arms of their significant others, they far too often meet their demise. Intimate partner homicide is a leading cause of death for Black females between the ages of 15 and 44. The disproportionality in the rates at which Black women experience domestic violence is alarming. According to extant data, four out of ten Black women experience violence in the home. These rates are extremely lower with Latinos, Asians, and White women. Unfortunately, Black women are less likely to report these acts of violence because of a lack of trust in the system itself, as well as the cultural nuances that limit our willingness to share what happens in our homes. Additionally, Black men are rarely treated fair and often judged based on erroneous stereotypes that present us as being violent and barbaric. While these assessments do not apply the vast majority of Black men, we are definitely judged based off of it. Unfortunately, the Black woman often takes it upon herself to protect the very person who is harming her because of the unfairness in which Black men are judged in the light of social observation. One of the primary focuses of the Black Men Lead rite of passage initiative at The Odyssey Project is to develop an early understanding of the role of the Black male to protect, not harm, the Black woman. We must change the social norms within the collective to reflect the idea that it is unacceptable for our men to harm our women or even leave them unprotected. This constant exposure to violence contributes to the high rate of depression and other forms of mental illness and dysfunctionality among Black women. We must develop a lucid perspicacity of the pernicious effect of the constant exposure to phsycial threat on the human mind and body in order to force us into a position in which we demand more of our men and challenge our women to refuse to accept and tolerate any form of abuse. ~ Rick Wallace, Ph.D., Psy.D.